Home » 10s » German Zeppelin Airship LZ 2 at Lake Constance, 1905. German Zeppelin Airship LZ 2 at Lake Constance, 1905. The LZ 2 was about the same as LZ 1, but significantly improved and increased on 30 November 1905 to the first short flight tests on. On 17 January 1906 was followed by the second and longer flight time. The airship was aborted but in this case of a strong wind over land, later denied the motors and the controller. Therefore, the Zeppelin was forced to land at Fish Reute / Sommersried Kißlegg where the provisionally anchored ship was irreparably damaged by a gathering storm in the night. 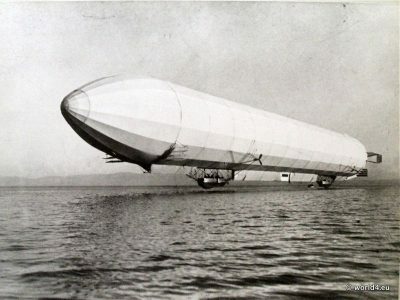 Previous PostGerman Airship LZ 1 at Lake Constance, 1900.